England's Ashes winning captain Charlotte Edwards has spent two days in Taunton this week working with the Somerset Under 13, 15 and 17 girl's age group cricketers. 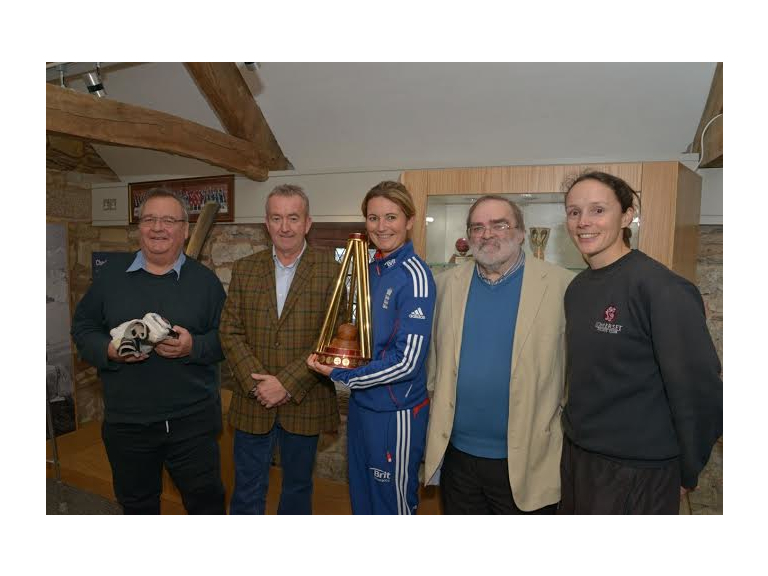 England's most successful captain, who has recently returned from defending the Ashes in Australia, took a break from her coaching duties on Tuesday afternoon to present Somerset's award winning Cricket Museum with a pair of batting gloves that she wore during her triumphant tour and also showed off the magnificent trophy her team retained during the winter. Charlotte has played a vital role in bringing women's cricket to the fore since making her England debut back in 1996 when she was just 16 years old. Since then the England captain has enjoyed some good times playing at the County Ground as she explained: "It's always great to come back to Taunton and I scored my first hundred here many years ago so it's a place I have got many fond memories of. The England team has always been pretty successful here too." Somerset's captain Anya Shrubsole, who hails from Bath was a member of the Ashes winning squad about whom the England captain said: "She has been outstanding for us over a few years now and she played a huge part in us being successful in the Test Match in Perth and I am hoping for more to come from Anya with her being so young as well." The England skipper's visit to the County Ground came about as part of her role as a Chance to Shine Ambassador, an initiative she has been involved with for six years. "I joined Chance to Shine in 2008 and it probably one of the best organisations I have been part of in terms of what it is doing and going into local schools and inspiring the next generation of girls, I have no doubt that in five years time we will see the fruits of this scheme. So far we have had 1,000,000 girls go through the programme which is a fantastic achievement and one I am very proud of."